I&M Canal Boat Tours will resume on Thursday August 16th 2018. Due to low water levels on the I&M Canal, boat tours are currently cancelled. We will resume boat tours on Thursday August 16th 2018 at 10:00am. 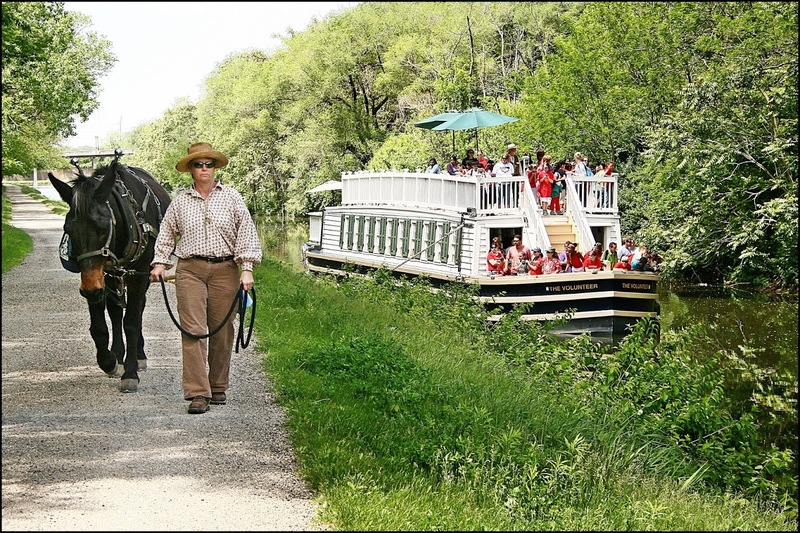 Take a journey back in time aboard the “Volunteer,” a 70-passenger, mule-pulled 1840’s replica canal boat, as it coasts gently up and down the I&M Canal. 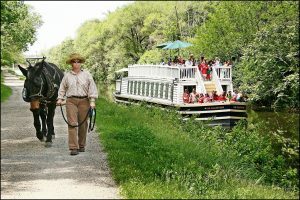 Every trip begins with “Mule Tending 101” as our period dressed guides introduce the passengers to their intrepid canal mules, Moe & Larry. The tour guide regales everyone with tales of the canal while the deck hands guide the boat a mile up the canal to the Little Vermillion aqueduct and back. 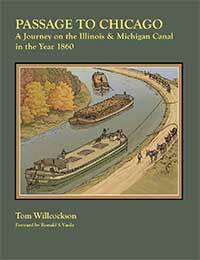 If you are in the LaSalle area visit the Lock 16 Café & I&M Visitor Center, 754 First St LaSalle, IL. The restored vintage building was once home to a horse buggy maker and is now a hub for activities, visitor information, I&M Canal exhibits, lectures, afternoon teas and cultural programs. The Lock 16 Cafe & Visitor Center is also a place to linger and learn at the history of the I&M Canal, dine and shop! Lock 16 is open Monday – Saturday 7:00am – 5:00pm & Sunday 7:30am – 4:30pm with the kitchen closing at 3:00pm daily. For more information call (815)220-1848×1838.